When you plan a vacation package in the Philippines you are preparing to explore the ultimate paradise. Less visited than many tourist destinations in the world, perhaps partly due to the significant journey time required. Once you arrive, however, you’ll see that it was worth the journey. The country is formed of an archipelago in the Pacific Ocean that comprises over seven thousand islands. 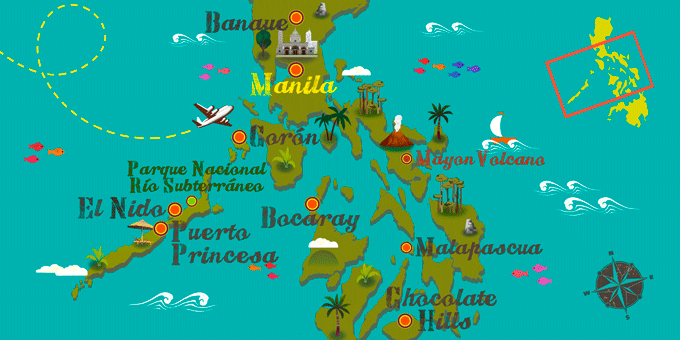 The Philippines is divided into three parts, Luzon in the north, the most visited, also home of the capital city, Manila. In the center is the Visayas, with their collection of indescribable isolated beaches. Finally, Mindanao in the south, a majority Muslim area which is less frequently featured in package tours to the Philippines. No visa is required for stays of up to 21 days. There are no mandatory vaccinations for travellers from EU countries however these are recommended. Although tap water is drinkable, it is advisable to drink bottled water.